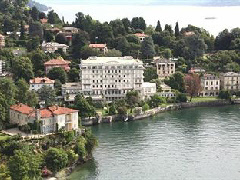 It should come as little surprise that a hotel commanding such a fine position on Lake Maggiore should have been so well patronised by the great and good of late nineteenth century Italy. In fact, the relaxed air and beautiful English-style grounds were as popular with European heads of state as the well-heeled of Milan, Rome and Turin. There is, however, a distinctly musical theme to the list of past guests, with the hotel a favourite of Claude Debussy and Arturo Toscanini. Part of the Small Luxury Hotels of the World group, Grand Hotel Majestic is classified as four-star and features a restaurant (La Beola), bar, and an indoor swimming pool.